The Kubota Soft Tool Bag is made to get the job done. Perfect for the jobsite or the DIYer. The Tool Bag features an open top design for quick access, triple stitching on pockets for strength and reinforced rivets at pressure points. Made of durable polyester fabric that will endure wear and tear. It has plenty of organization options with ten outside pockets and eight inside pockets. Equipped with a comfortable padded handle and rugged detachable carrying strap. The PACKOUT modular storage system is the industry's most durable and versatile storage system. The PACKOUT Tech Bag has an impact-resistant molded base that connects with other PACKOUT system components via integrated locking cleats. The bag is constructed with tear resistant 1680D ballistic material, heavy-duty zippers and all metal hardware for lasting durability. With 58-pockets, including a hard shell pocket designed for sensitive equipment and a protected laptop sleeve, the PACKOUT Tech Bag provides exceptional organization. The PACKOUT modular storage allows users to customize and build their own storage system to easily transport and organize tools and accessories. Milwaukee Zipper Pouches feature a breathable and durable heavy-duty canvas construction, as well as a heavy-duty zipper for a lifetime of use. The weather resistant standup bottom allows easy access to the pouches interior, while protecting its contents. Constructed of Heavy-Duty No. 10 Canvas while offering a limited lifetime warranty. Perfect for all types of job sites. Part of the industry's most versatile and most durable modular storage system, Milwaukee Tools 15 PACKOUT Tool Bag features an impact resistant molded base that fully integrates with all PACKOUT system components. Constructed with 1680D ballistic material and all metal hardware, the 15 inch tool bag is designed for ultimate durability. Additionally, the 15 inch tool bag features versatile carrying with a cushioned shoulder strap, top handles and side handles for easy transport of power tools, hand tools and accessories. Overall, the 15 Tool Bag provides accessible storage and connectivity with all PACKOUT products. Milwaukee Tools jobsite cooler is specifically designed to be durable enough to withstand tough jobsite conditions. The cooler utilizes double insulation and a food-grade leak proof liner to keep ice cold for 24 hours without leaking. Additionally, Milwaukee constructed the cooler with 1680D ballistic material base and heavy duty metal zippers for a longer life. A tape measure clip with a bottle opener provides ultimate versatility. Lastly, Milwaukee implemented a tech pocket and dry storage compartment to make this cooler a versatile jobsite storage solution. 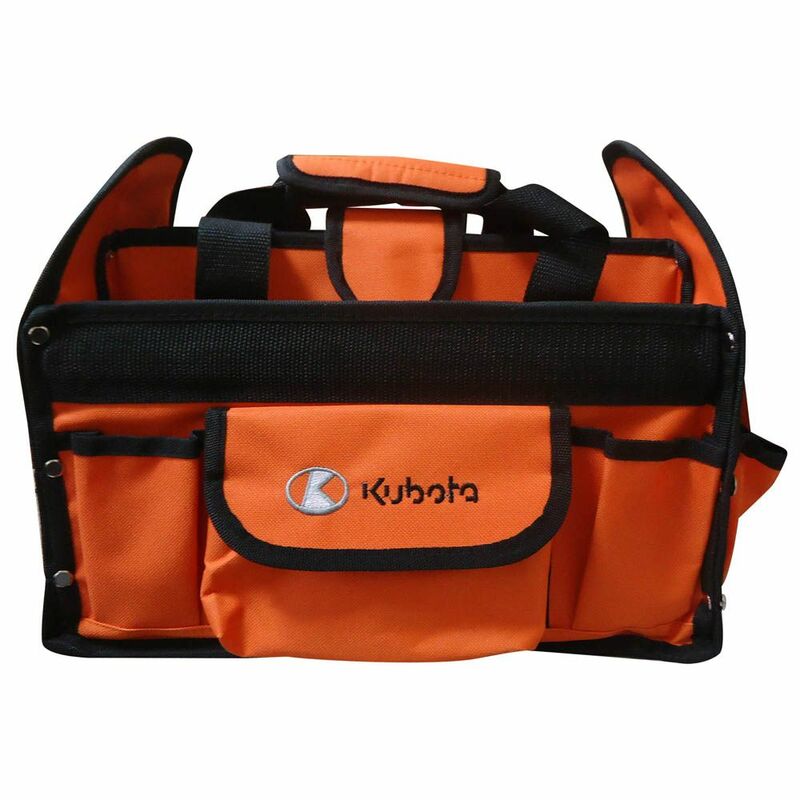 Soft Tool Bag The Kubota Soft Tool Bag is made to get the job done. Perfect for the jobsite or the DIYer. The Tool Bag features an open top design for quick access, triple stitching on pockets for strength and reinforced rivets at pressure points. Made of durable polyester fabric that will endure wear and tear. It has plenty of organization options with ten outside pockets and eight inside pockets. Equipped with a comfortable padded handle and rugged detachable carrying strap.